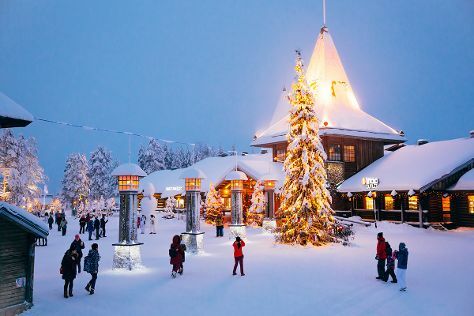 Start off your visit on the 19th (Sat): look for gifts at Your Piece Of Finland, get engrossed in the history at Arktikum, then see Santa Claus Office, and finally get in on the family fun at Santa Claus Village. To find reviews, other places to visit, and more tourist information, use the Rovaniemi day trip site . Washington DC, USA to Rovaniemi is an approximately 19-hour flight. You can also do a combination of subway, bus, and flight; or do a combination of train and flight. The time zone changes from Eastern Standard Time (EST) to Eastern European Time (EET), which is usually a 7 hour difference. Traveling from Washington DC in October, things will get colder in Rovaniemi: highs are around 37°F and lows about 30°F. Finish your sightseeing early on the 19th (Sat) so you can travel to Koli National Park. Start off your visit on the 20th (Sun): explore the activities along Pielinen and then get outside with Neitikoski Rapids. Get ready for a full day of sightseeing on the next day: enjoy breathtaking views from Rasavaara Observation tower, then trek along Akka-Koli Hill, and then trek along Paha-Koli Hill. To see photos, traveler tips, where to stay, and more tourist information, read our Koli National Park online trip planner . Getting from Rovaniemi to Koli National Park by car takes about 6 hours. Other options: fly. Expect a daytime high around 42°F in October, and nighttime lows around 33°F. Finish up your sightseeing early on the 21st (Mon) so you can travel to Helsinki. Go for a jaunt from Helsinki to Espoo to see Nuuksio National Park about 46 minutes away. Pack the 25th (Fri) with family-friendly diversions at Linnanmaki Amusement Park. Next up on the itinerary: brush up on your military savvy at Sea Fortress Suomenlinna, make a trip to Senate Square, take in the spiritual surroundings of Kamppi Chapel of Silence, and admire the landmark architecture of Rock Church. To see maps, photos, more things to do, and tourist information, read our Helsinki day trip website . The Route module can help you plan travel from Koli National Park to Helsinki. When traveling from Koli National Park in October, plan for somewhat warmer days in Helsinki, with highs around 48°F, while nights are about the same with lows around 35°F. Finish your sightseeing early on the 26th (Sat) to allow enough time to travel back home.